Airwheel S3 2-wheeled Intelligent Scooter, Travel Smart, Travel Green. Abstract: You become sick of the haze, and you’ve got tired of the traffic congestion. You want to make your own contribution to a green earth, and you want to see a blue sea and the blue sky. You want to whiz through crowds freely and you want to lead an unrestrained life. Well, the Airwheel S3 can satisfy all your expectations and help you care for the environment. Environmental-friendly, the Airwheel S3 is driven by electricity and emits no exhaust to the air. It can be part of your green lifestyle. The S3 is fitted with dual intelligent chips and a potent lithium battery core originally produced by Sony. For different needs, the capacity of S3 has two options, 520kwh and 680kwh. Another feature of S3 is its lightness. You can’t imagine such a personal transporter weighs only 22.4kg. But it is true. It can be carried to nearly everywhere. The reason why the S3 can be so light lies mainly in its material. The case of the S3 is made with polymer nano-materials which is extremely light yet very durable at the same time. 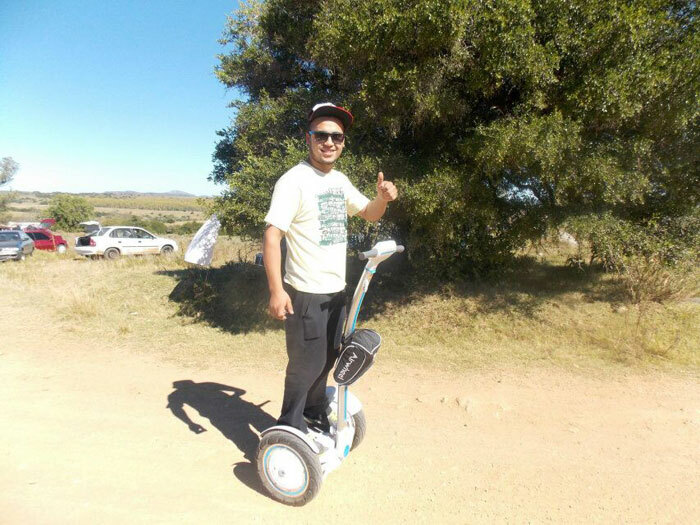 The Airwheel S3 can be used for commuting or outing as it greatly saves your walking time while offering you much fun. Apart from these features, another notable advantage about the S3 is its agility. In the street, where cars outnumber people, traffic congestions are the most common occasions. The Airwheel S3 can take you whiz through lanes and pavements and leave others anxiously waiting in cars. The S3 is the choice of the young people. No matter you admit it or not, the traditional means of transportation are being replaced by the the Airwheel S3 2-wheeled electric scooter. The world will witness a new era that belongs to the S3. As spring approaches, why not scoot your S3 and go out into the nature?